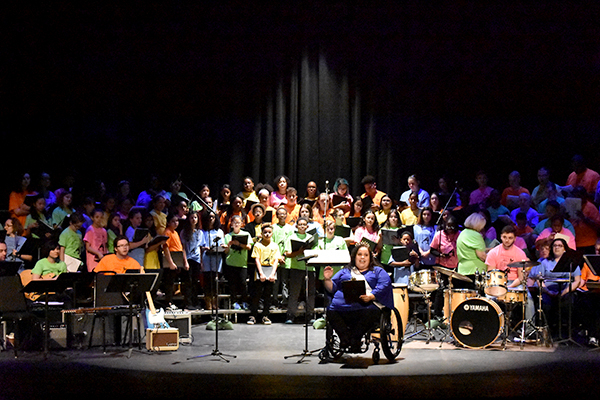 The stage at the Wilkins Theater at Kean University was ablaze with the energy and Day-Glo tee-shirts of musicians with disabilities from Community Access Unlimited (CAU) and university music majors at the group’s fourth annual collaborative concert. CAU is a Union County-based, statewide nonprofit that strives to integrate people with disabilities and at-risk youth into the general community through housing, vocational and life-skills training, education, advocacy, recreation and more. The two-hour concert, entitled “Inspire, Believe, Uplift,” featured 25 singers, including 10 musicians from CAU’s Academy of Continuing Education (ACE) for adults with disabilities and 30 Kean music majors, joined by choirs from Elizabeth, Rahway, Roselle Park and Union middle schools — all connected by the international language of music. 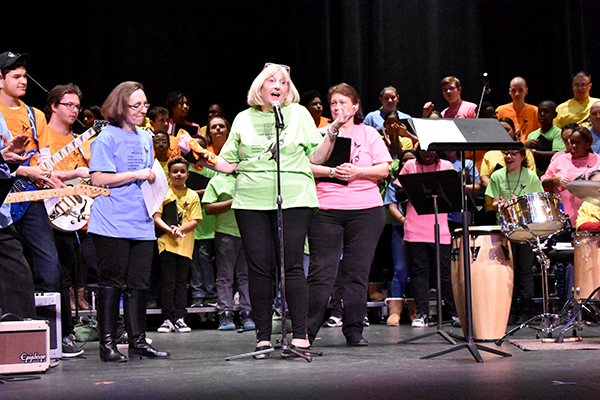 Modero reached out to Kean’s music education coordinator, Lyn Schraer-Joiner, who embraced the idea of collaboration. These yearly performances have been a true partnership that has enriched the lives of everyone involved, Modero said. CAU member Dipen Trivedi, a second-year performer and a pianist, said the show is an amazing experience that allows CAU members to learn and perform musical material. Modero said she is delighted every year to see the show’s progress and how rewarding it is for the musicians and audience alike, according to Modero. For the Kean music majors who have been working with ACE students for the last four years, the experience has enhanced their own abilities as future teachers, Schraer-Joiner added. In addition, Modero and Schraer-Joiner both said the concert experience helps to dispel the myths about people with disabilities for the middle school youth who performed alongside them. The program was made possible in part by a HEART (History, Education, Arts Reaching Thousands) Grant from the Union County Board of Freeholders. 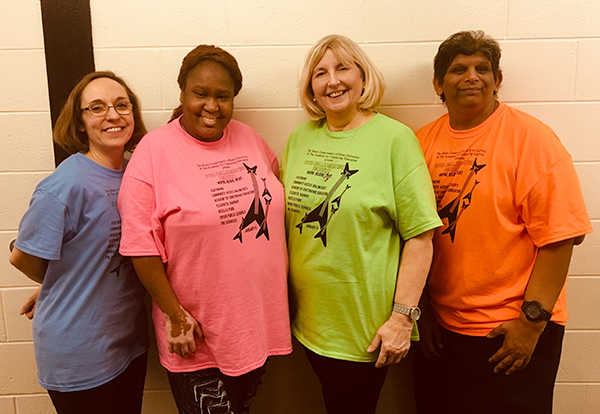 Community Access Unlimited (CAU), celebrating its 40th year in 2019, supports people with special needs in achieving real lives in the community. CAU provides support and gives voice to adults and youth who traditionally have little support and no voice in society. CAU helps people with housing, life skills, employment, money management, socialization and civic activities. CAU also supports opportunities for advocacy through training in assertiveness, decision-making and civil rights. CAU currently serves more than 6,000 individuals and families, with the number served growing each year. For more information about CAU and its services, contact us by phone at 908-354-3040, online at caunj.org or by mail at 80 West Grand Street, Elizabeth, NJ 07202. (above) Musicians with disabilities Melody Lukas (second from left) and Dipen Trivedi (right) are joined by Lyn Schraer-Joiner (left), Kean University music education coordinator, and Marguerite Modero, musical director at the Academy of Continuing Education at the nonprofit Community Access Unlimited. (above) Modero thanks Kean and CAU collaborators.